The Hindu Brihadaranyaka Upanishad mentions a hierarchy of four basic states of consciousness that compose mankind's experience. However, the four states (deep sleep, dreaming, waking, and samadhi or the spiritual trance that brings union with Brahman) constitute a bare bones outline, and very little is said about the relationship of these states to each other, or how an individual in one state perceives the other states. The following essay is an attempt to describe a broader variety of states, and includes states that change over time such as after-death states and the states of historical memory that span lives or incarnations. We will also describe the rules by which an individual perceives or remembers one state from another. The overarching analogy that best describes the relationship of the adjoining states of our new hierarchy to one another is the relationship between the waking state and the dream. The author acknowledges a Buddhist bias in developing this hierarchy and assumes that the highest Buddhist state (Nirvana) is beyond the Christian heaven. This state therefore is assumed to provide a broader view of the universe than is afforded by heavenly states described in Christianity or other religions with heavens such as Pure Land Buddhism. This statement is not meant to disparage deities many of whom have vast awareness that manifests as great fountains of wisdom, love, power, and creativity in the spiritual worlds. These deities provide access to spiritual worlds to countless individuals following their deaths. The statement is only meant to acknowledge that any qualities or personal attributes associated with a deity represent a narrowing and limiting of infinite Truth. But now let us return to the topic of this essay, the hierarchy of dreams. The dream is only understood to be false when the dreamer awakens. During the dream, the world encountered is understood to be real. Its "illusion" is not recognized during the dream. As we shall see later, this limited form of awareness which cannot recognize illusion can give us insight into why materialists so strenuously deny the spiritual world. However, each time we wake up, we have the realization that it was only a dream. Illusions cannot harm what is real. We are safe in the real world, and the dream could never have harmed us. But we were deluded and we thought that the phantoms we encountered in the nightmare we had last night were a threat to us. Was the dreamer ignorant or insane or primitive or immature or evil? No - he or she was simply unaware. What are the characteristics of a dream which cause dreamers to make this mistake in judgment and to lack awareness? We can see the following limitations in dreams when we wake up. But we can see these truths only in hindsight when our awareness shifts to waking awareness. There must therefore be degrees of awareness. So let us speculate on these degrees of awareness. Let us make a hierarchy of these degrees of awareness, going from low to high, that incorporates the concepts and insights that we derive from dreams, spiritual travel, and world religions. Here is our hierarchy of levels of awareness listed in order from lowest to highest. Now let us try to relate these states to one another. The author's argument is that as we move from a lower level to the next higher level, it is like waking up from a dream. As we go from a normal dream to a lucid dream, we gain freedom, increased awareness, and self-determination. We are asleep and wake up in a dream. The dream then changes no longer resembling its earlier form. The symbolic content of the dream usually shuts down as we begin to examine the dream environment, and take control of the dream. We have shifted to a state of greater awareness in the lucid dream and can see that the dream state was a kind of sleep-walking. Our awareness was dimmed or dulled in the dream but it has now become bright and sharp in the lucid dream. But when we wake up from either a lucid dream or normal dream, we gain awareness and generally conclude they were both unreal and not very important in the scheme of things. We are in normal waking awareness and realize the limitations of the dream described above. But what about the next level? Let us accept a generic religious claim (derived from Christianity, Islam, Hinduism, and Buddhism), and assume that there is such a thing as heaven, hell, and afterlife worlds. One of the things we hear is that heaven or hell is eternal, or at least lasts a very long time. If we stay in heaven thousands of years ("When we've been here ten thousand years bright shining as the sun ..." as the Christian hymn Amazing Grace goes when referring to heaven), and we look back on our former earthly life, it will seem like a dream. Just like a dream, it lasted for a short period (perhaps 75 years) and disappeared never to return. After such a long time in heaven, it will not seem very important. We will look back on our earthly life as if it were a dream. But even after a short time following our death as we notice that we still have awareness, we will begin to look at our former life as a kind of extended dream. It lasted for a finite period and now it is gone and replaced by a different form of awareness. Our whole complex, familiar earthly existence simply vanished like a dream. Now let us assume, as the Buddhists and Hindus do, that our time in heaven or hell is finite, and that there is reincarnation. In this approach, people are reborn in different worlds (heaven, earth, ancestor worlds) and evolve spiritually in the process. In this case, a new life (or incarnation) will make the previous incarnation seem like a dream. If we become aware of memories from our past lives, they will seem like distant memories or dreams that are of little importance. Like the dream, we have left them behind and can never return to live fully in that life again. For those who have experienced a deep past life regression, some have claimed that the experience of the past life was so real that they believed temporarily that their past life was the real life and their current life seemed distant and unreal like a dream. Upon leaving the past life regression, the situation reverses and the current life again becomes the real one. Reality and dream (past and present) can switch sides when examining past lives. The structure of the personality and its network of memories seems to stay intact following death and are still accessible to those who explore past lives in depth. Remembering multiple lives in sufficient detail will give us a unique perspective on our experience, helping us to see our current life in a context of a broader series of lives and experiences. The person who in the dream of everyday life identified him or herself with a single personality wakes up to discover other layers of personalities that are inherited from previous lives. As such, this awakening can be classified as a higher form (or degree) of awareness that brings wisdom and increased vision to our waking awareness. This vision will also provide us with a unique attitude towards death since we will know (instead of only hope) it is but a transition and not the end of our existence. But as we go through hundreds and thousands of lives and become wiser spiritually, we may begin to seek liberation or enlightenment. And when we become enlightened according to Buddhist thought, we become Buddhas. The Buddha is the "awakened one". He or she has awakened from the dream of life. However this dream we call life is complex. It consists of dream life, of waking life, of after-lives (heavens and hells), and of repeated incarnations (many lives). When the person has his or her final awakening, he or she will encounter ultimate reality and all previous dreams will cease. The Buddha has awakened fully from the many dreams of existence and has finally encountered what is ultimately real. And each awakening makes the previous existence seem in varying ways like a dream. A second observation when describing the relationship of these states of consciousness to each other is that our vision is unidirectional vertically. In other words, we can perceive or remember what is below but not what is above. The waking person can generally see (be aware of and remember) his or her dreams which are "below" waking awareness in our hierarchy. But past afterlife (heaven or hell) states (which reside above waking awareness) are invisible and cannot be remembered. Because there is usually no evidence for or awareness of afterlife states, faith becomes a very important psychological component of many religions. The waking person also cannot usually remember what happened prior to his or her birth (past lives), since that experience also exists "above" the person in our hierarchy. The person in the afterlife is generally assumed to be able to (look "down" to) remember his previous existence on earth. This, after all, was what brought the person to the appropriate state of heaven or hell. In Christian thought, it is assumed that it is the person's behavior on earth that results in their afterlife state, and justice requires that people be aware of how their earthly actions affect their afterlife. But, based on most Christian cosmologies, the person in heaven or hell cannot look "up" and see any direct evidence for the existence multiple lives or any evidence for the existence of the state of enlightenment. This may explain why there is no mention of either of these states in Christian thought. Heaven is assumed to be the highest state attainable by human beings in the Christian tradition. It is also generally believed that the individual only lives one life on earth followed by an eternal afterlife. The heavenly afterlife will seem like a type of joyous waking existence, but possibly without the sense of anticipation of a future death (i.e., it may seem eternal). Similarly, the individual who can perceive past lives and looks "down" to remember these past lives has direct evidence of his or her earlier lives because of the complex set of memories associated with these previous existences in both earthly and supernatural worlds. Such a person can potentially remember past lives in heaven, hell, and on earth. But the individual who can perceive previous lives still cannot look "up", and therefore has no experiential evidence for or direct knowledge of the state of enlightenment. Lastly, according to Buddhist thought, the Buddha, Bodhisattva, or the enlightened person can look "down" and see all worlds, all states of being, and all previous existences but realizes they are all empty and devoid of substance. The enlightened person can see everything below because he or she is at the top of the hierarchy. However, everything that is seen (past or present) will seem like a dream. Past experiences that seemed very real at the time will have lost their drama and importance, and any identification with them will have evaporated like morning fog. In the present, those caught in the various levels of our dream hierarchy will look like phantom figures having mock experiences and fighting mock battles. One quality of experience that may help the reader understand this concept of emptiness is perceptual transparency. Transparency of perception occurs when an individual looks through (or shifts from) one world into another making the previous world seem illusory or dream-like. This phenomenon of transparency is something experienced when the lucid dreamer observes the process of waking up. The lucid dream body becomes transparent to waking perception and disappears all together as one finds oneself back in the physical body. The lucid dreamer knows that the seemingly solid world of his or her lucid dream is a temporary space that will disappear slowly like water as it evaporates on hot pavement in the process of waking up and returning to the physical body. Spiritual travel experience also causes the physical world to become temporarily transparent to the psychic or spiritual worlds. One clear example of this kind of travel occurs when the person having a near-death experience enters the "dark tunnel" that leads to another world. The person is generally first looking at the outer world (in an out-of-body state) and then finds him or her self moving at tremendous speed through a tunnel as perception of the physical world fades or disappears. A more rapid kind of transition to another space occurs when the traveler shifts or skips from one lucid dream environment to another. The most dramatic example of seeing through one world into the next occurs at death where there is a permanent transition to a different plane of existence and physical perception ceases as the world of the afterlife comes into focus. All the above experiences require a dramatic transition when shifting perception from one world to another. However on a more subtle level, people routinely shift from physical perceptions to the imagination and back again. It is seamless and hardly noticed but the physical perception loses focus becoming transparent as the imagination temporarily takes over. People who use mind altering drugs also "space out" and can spend hours completely engrossed in non-physical or psychic experience as physical perceptions cease to be stong enough to attract their attention. For individuals who have not experienced spiritual travel and therefore experience themselves as completely one with the physical body and its limited form of perception, the concepts of moving between worlds and transparency of perception are difficult to understand, and something that is likely to be an object of skepticism. However these concepts may give insight into the nature of the enlightened mind for one who is open to the religious goals of moksha or spiritual freedom. When we look at the enlightened person as an advanced spiritual traveler, we can assert that the enlightened mind is able to shift (i.e., travel, or in more popular terminology "trip") between universes composed of vastly different kinds of perception. This freedom to move through the planes of consciousness, identity, and perception make the field of vision so large that all that is experienced looks transparent to something else so that every form or perception is perceived as an illusory layer of an infinitely layered universe. In other words since all perceptions are fleeting and potentially transparent, they seem like a dream. Leaving behind or seeing through one layer and focusing on the next is like waking from a dream. Another way of saying that all environments and perceptions are illusory or transparent is to say that they are empty or devoid of substance. This is the way Buddhists describe the world but many find it difficult to understand the meaning of this claim without understanding the nature of spiritual travel experience. The surface of the water of a lake reflects the surrounding light composed of trees and clouds but it can quickly reveal a completely different underwater world beneath it with a slight change of focus. The surface reflections are then exposed to be an illusory world that had seemed real. As the surface becomes transparent, the underwater world dominates and eventually blots out the surface reflections entirely. Now try and imagine a trillion worlds or layers of perception instead of only two. Each world can be a focus of perception but that world can and will become transparent as another one of the countless worlds comes into focus. The more profound perception of the Buddha is the ability to perceive all these levels at once as an infinite ocean of change. But beyond even this is the capacity to perceive the profound spiritual emptiness from which all these worlds arise and upon which they all depend. Spiritual freedom or liberation means not being tethered to any one layer or subset of layers (such as normally occurs when one is incarnate in a physical body) while also being aware of the emptiness that is the source of all the layers. There are two other analogies that may be helpful in understanding the emptiness of objects and phenomena. The Javanese shadow puppet plays are full of drama and complex character interactions but the players are completely composed of shadows. A shadow is a form without substance but one capable of complex role playing and dynamic movement. Similarly Plato described the material world as a complex of shadows whose existence depends on invisible, higher order, divine or ideal forms. The physical world is composed of the shadow projections of these higher forms. Shadows are good examples of empty or insubstantial forms. The Buddha or Bodhisattva who perceives all lokas or levels of existence can look into the many worlds of other beings and out of compassion tries to help them wake up and realize the unreal, empty, or dreamlike nature of their experience. The profound insight that reveals the countless beings that are suffering in illusory worlds creates an enormous feeling of sympathy and compassion that motivates liberated beings to try to eliminate such suffering. This perception is the basis for the deeply held principle of compassion in Buddhism. The enlightened person is at the top of the hierarchy of awareness and therefore cannot look up since there is nothing to see. This parallels the person in the dream state who cannot look down since, being at the bottom of the hierarchy, there is also nothing the see. The person with the most vision and awareness resides at the top of the hierarchy and the person at the bottom (i.e., in a dream state) is the most limited and has the most narrow vision. In general, the author will make the claim that each level is increasingly "real" as we move up the hierarchy. As we wake up from each level on the hierarchy, we realize that each of the previous levels was "dream-like" or, in philosophical terms, ontologically inferior to the present level. The important exception to this generalization is that the spiritual states encountered in spiritual travel or near-death experience may allow one to jump into higher levels of the hierarchy. That is why spiritual travel is so unusual and valuable. This exception accounts for why lucid dreaming does not conform with the rules that govern the hierarchy i.e., we are aware of the next higher level of awareness (waking existence) during the lucid dream, which breaks the rule. Lucid dreams can provide us with awareness of the states that reside "above" waking existence in the hierarchy which is what mystical and out-of-body experience does. Such experience breaks all the rules that normally limit our awareness. Theories are supposed to give explanations for situations in the world that otherwise seem difficult to explain. We have numerous claims by multiple religious systems throughout the world that there are many transcendent spiritual realities. But few of these often conflicting claims can be substantiated and they are difficult to organize into a coherent system. What does our new theory about the hierarchical nature of awareness seek to explain? It explains why the term Buddha means "awakened one" and why becoming enlightened in Buddhism is described as an "awakening from sleep"
It may explain why many theistic religions are sure that their deity is the supreme being, and that their deity's heaven is an ultimate and eternal state (see below). Monotheistic religions seldom acknowledge reincarnation or states more transcendent than the heaven of their deity because the cyclic view of life supported by the doctrine of reincarnation challenges the eternal nature of heaven and the ultimate importance of a single life. When heaven is not eternal, the deity that runs the heaven tends to lose the quality of omnipotence since he is no longer in complete control of the individual's afterlife (and the loss of other qualities such as omniscience tends to follow). The doctrine of linear time where there is a single birth, life, death, judgment, and eternal afterlife for the individual (as opposed to cyclic time) is thus a required feature of most monotheistic religions. However from the point of view of a devotee, the mind of the deity is so vast and the sphere of the deity's control so enormous that the fact that the deity did not create and does not control the entire universe is not of critical importance. The fact that the deity is powerful enough to offer some form of salvation or a positive afterlife environment to the devotee following death is what usually matters most. The blind are only aware of their blindness if a seeing person explains to them that they are blind. Similarly, dreamers can only find the motivation to wake up if they become aware that they are dreaming. This applies especially to lucid dreaming and to spiritual enlightenment. This is why we need religions and mystics that talk about transcendent worlds of eternal truth and beauty. 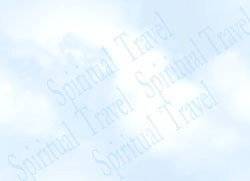 It also applies to people who seek spiritual experience through spiritual travel. The skeptics are caught in the dream world of everyday existence. The nature of this and all dream worlds make them certain that there is no afterlife (higher world) based on the absence of spiritual or transcendent experience in their own lives. To repeat, they cannot see upward. This is the mystery of awareness. It is also the mystery of ignorance. In many ways, it is this certainty that is truly the dream and the illusion. We are wrong all the time when it comes to judging what is real in the dream but we always assume we have it right this time. We love the certainty of our narrow view of the world and the assurance that we are right no matter how many times we are proven wrong. Spiritual travel and near-death experience presents further evidence that we are wrong in assuming that waking consciousness is the ground or truest aspect of existence, and other worlds do not exist. Tonight, most of us will be sure in our dreams that the world we encounter is real, and wake up as we have thousands of times before to discover it was unreal. But few will reflect on our recurring inability to judge what is real. Few will consider the possibility that our senses do not give us an accurate view of the universe. Few will discover that our ability to judge the reality of a situation is limited by our state of consciousness. For those who do spiritual travel and explore it in depth, it is well known that our perceptions are also limited by our state of consciousness. If we did such reflection and analysis, we might change our approach and begin to seek out that which is real by setting out on the spiritual path.